The forest is alive with mushrooms. Everywhere you look mushrooms are sprouting up in every different size, shape and color. I keep expecting little gnomes to jump out at me. I have caught myself shoulder checking more than once. Today I kept hearing voices and my imagination got the best of me. I realized part way through my walk that the woods were alive with pickers. I could hear them, but just couldn't see them. One day I will learn the difference between edible and not so edible. For now, I will stick with pictures ~ lots of pictures. My poor Instagram friends are probably starting to think I have become a bit mad, or at least found the magic in it all. Ha! 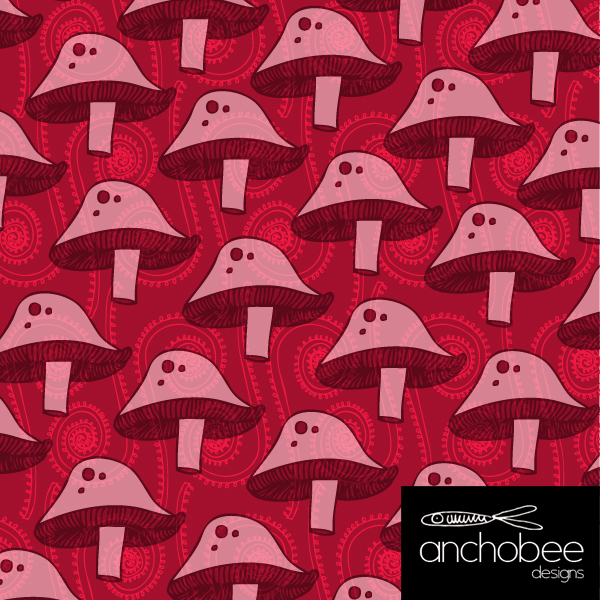 [gallery type="rectangular" ids="5044,5042,5043,5045,5046"] Today we have mushrooms for you in all shapes and sizes. I put a shout out to my artist friends asking for their mushroom inspiration. 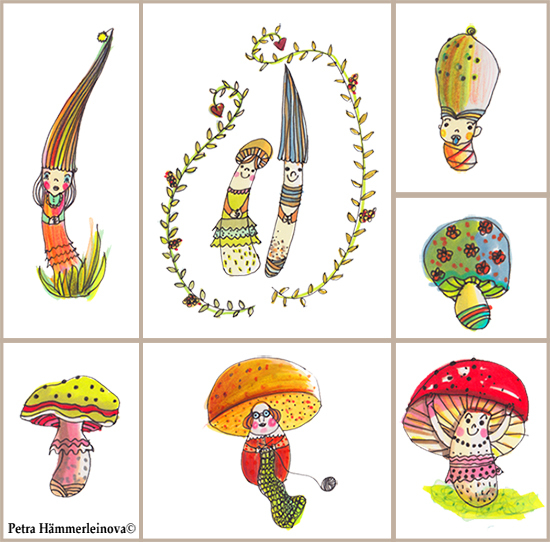 I love what I received and am happy to be able to share them with you.We have mushrooms doodled, sketched, painted, in pattern and even in character! Here are a few of mine doodled out in black and white. I am not sure what I am going to do with these, but I have a couple of ideas percolating! 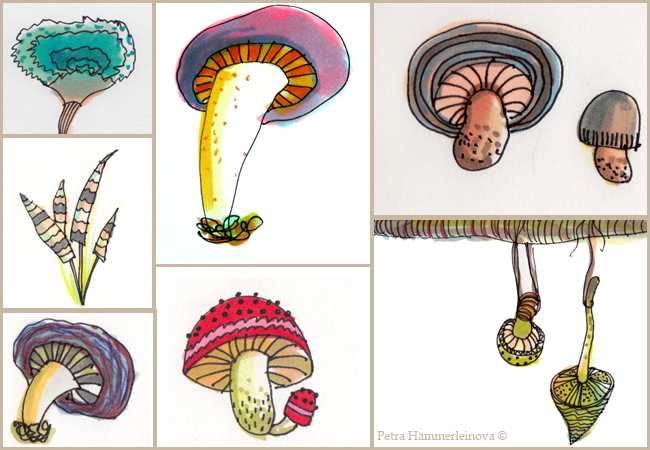 Have a look at these beautiful representations of mushrooms by Cheryl Bakke Martin.So natural in color and line. I love the sketchy feel of them. [gallery type="rectangular" ids="5033,5032,5031,5034"] Petra is also lucky enough to be surrounded by mushrooms. She has many a blogpost about her mushroom inspiration.She has a czech mother crazy for mushroom picking. Have a visit to her blog for many a good story. I was just recently introduced to her blog and it is fun and fresh. Petra has a very good sense of humour and her posts bring a smile to my face. 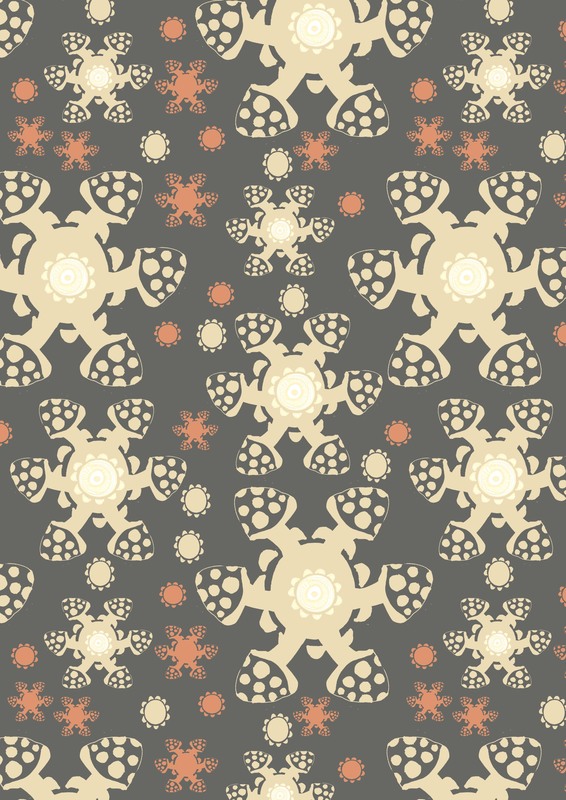 How about some mushrooms in pattern? 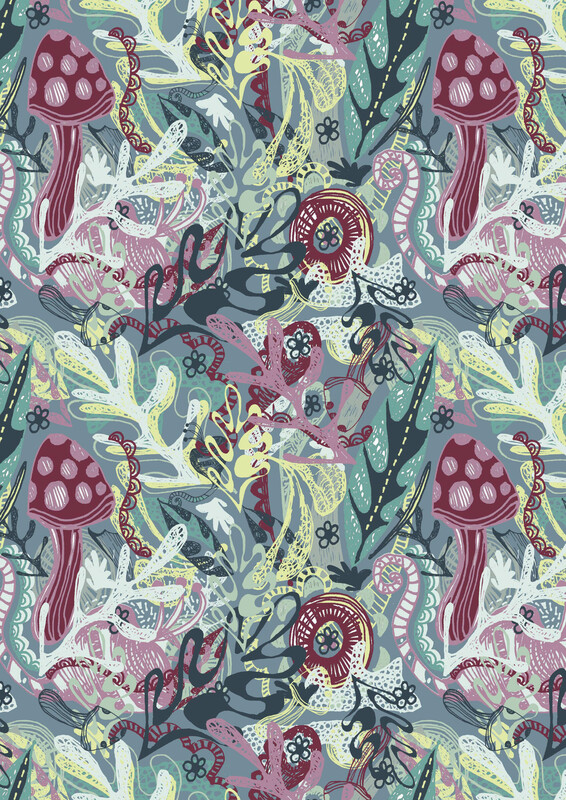 I love Lindsay Bucks use of color,shape and texture in her first piece Fantastic Funghi. There is so much to look at. Lindsay has lots more on her blog- her latest post on conkers still has me trying to guess what a conker is!? Andrea Rincon also placed hers in pattern.Love the transparency! Andrea has a great blog with a weekly brief to help inspire and get your creative juices flowing~ Brief? Me!. 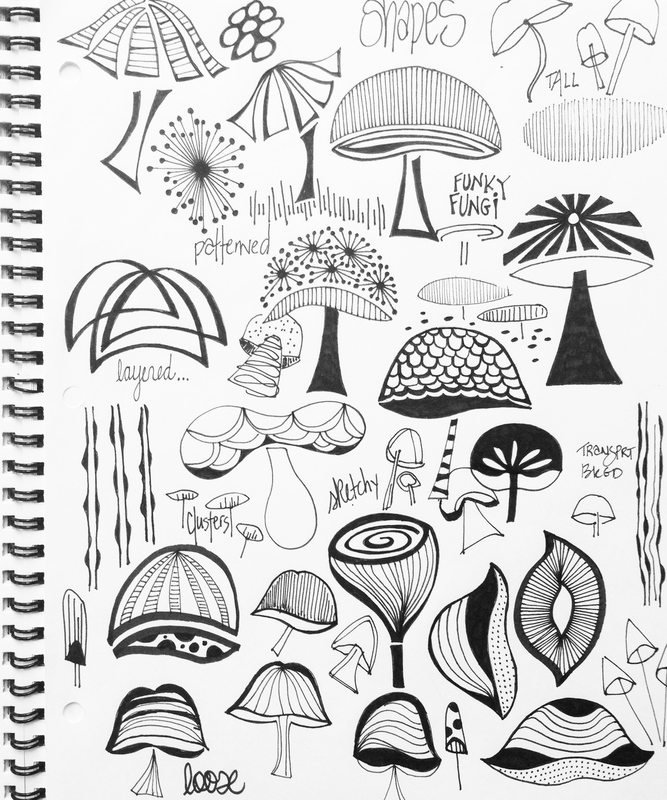 She recently had a creative brief on her blog about funky mushrooms. 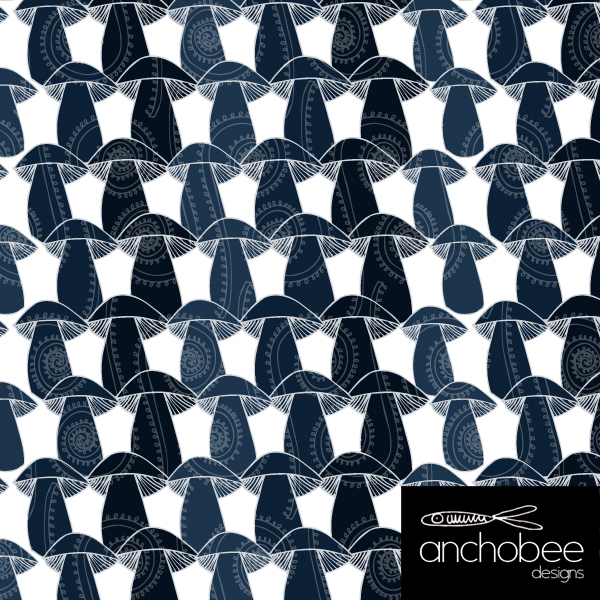 If you would like to participate and get inspired ,have a visit to her blog, Anchobee Designs for more information. This week finds me back in student mode. Lilla Rogers Make Art that Sells Part B starts today. I am so excited to be learning again. I love creating to a brief, it's such a challenge and really helps me focus on a topic. 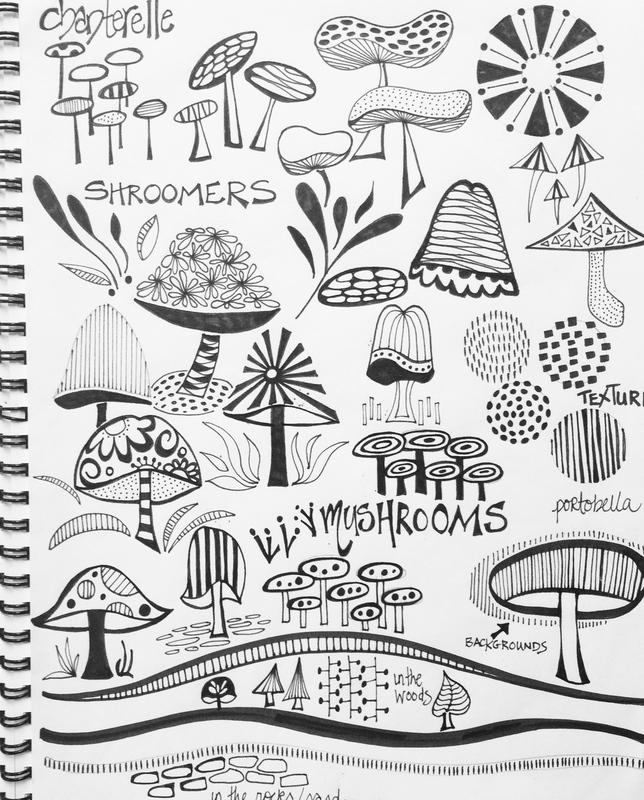 Funny - she had me drawing mushrooms 6 months ago! I have been a bit obsessed ever since. I will be popping back here weekly with updates on how class is rolling out.